The Cliff Hotel01493 662179work01493 653617fax HotelThe Cliff Hotel at Gorleston-on-Sea near Great Yarmouth, under new managemnt and owned by the ihotels Ltd group, overlooks the picturesque harbour and is just a short walk from Gorleston’s beach and promenade. This premier hotel offers a special blend of luxury accommodation and friendly service that has made it one of the east coast’s most popular hotels for business and holiday travellers. Dine in the stylish restaurant where there is a choice of table d'hote and à la carte menus. At weekends the resident pianist adds to the exclusive atmosphere. Churchill’s Bar offers a relaxed ambience, a well stocked bar and a wide selection of light meals and snacks which are served throughout the day. The comfortable cocktail lounge is ideal for pre and post dinner drinks. The Music Room has been recently renovated making it the perfect place for weddings, parties and private dining. The hotel specialises in providing tailor-made packages to suit your requirements and budget. 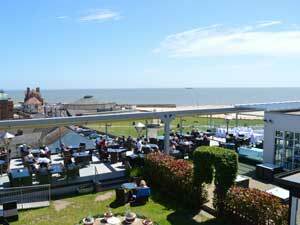 The Cliff Hotel at Gorleston-on-Sea near Great Yarmouth, under new managemnt and owned by the ihotels Ltd group, overlooks the picturesque harbour and is just a short walk from Gorleston’s beach and promenade. From Great Yarmouth - 3 miles By taxi.